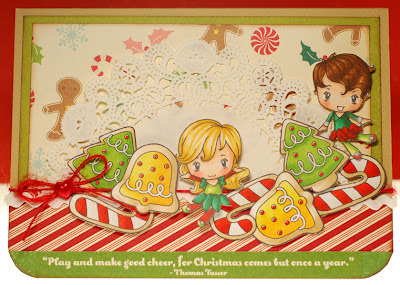 Awwww... my last card of 2011. Seriously though, this past year was pretty good to me and I'll just be happy if I can keep the momentum going through 2012. How about you? Any big dreams you'll be chasing this year? 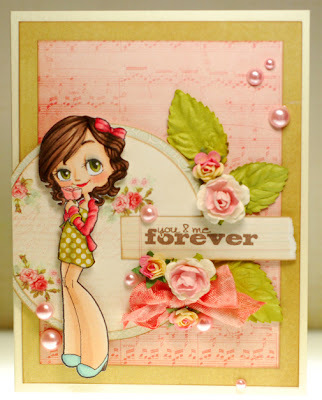 So when it came time to create my card for New Year's I wanted to do something fun and upbeat. I started flipping through my stamps and came across little Kiyoko here. With her sparklers ablaze she seemed the perfect choice. Plus I had just received this fab pack of Japanese origami papers from my December Secret Sister, Mimi. The gold and red combo seemed quite fitting so I even paper pieced her kimono to match. It's all very shimmery in real life though as always it's hard to pick that up in the photo. Well, I'm going to ringing in the new year with some pals tonight so I'll be taking one more break here on the blog tomorrow. But I'll be back on the 2nd and diving right into some Sweet November preview goodness to kick off 2012's releases. Something about this card turned out kinda dark but I'm still diggin' it. I used one of the Pergamano flower girls and just trimmed her out from her surrounding flowers so that she could sit on the ribbon. She looks a little lonely so I'm thinking this could work as a sympathy or "cheer up" kind of card. I was even feeling all crafty like by making some coordinating rolled roses out of the reverse side of the black text paper. Alrighty, well I suppose I should go do the hair and make-up thing. Have a great weekend everybody! 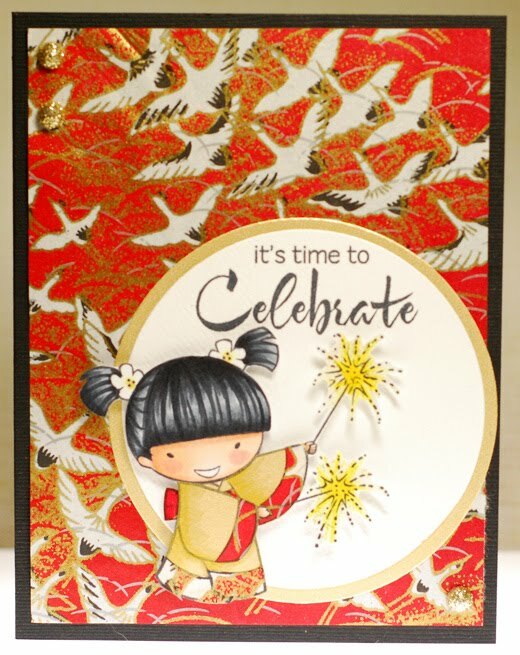 I think this may be a first time that I've used the same stamp on back-to-back cards here on the ol' blog as I usually try to mix things up a bit. But I made this one back during the SOG Valentine previews and didn't get a chance to post it here yet. 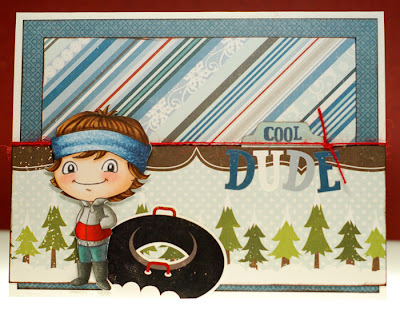 Then when I started looking at my upcoming January calendar schedule it is already going to be chalk full of new and fun stamps so I had to take advantage of one of these few 'free' days before January hits to get this one on here. There are plenty of different elements in the photo that you can pull inspiration from, like the wood grain, hearts, the color red, book pages, tickets, etc etc etc. 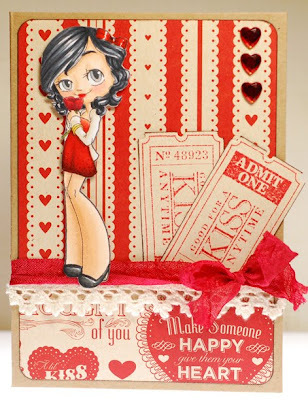 The biggest inspirations that I incorporated onto my card are the hearts, color red and the use of ticket embellishments. I paired those all up with the lovely miss Romantic Gwen. Isn't she dreamy? 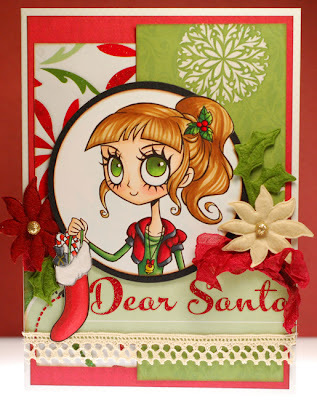 I have to admit that when I was putting this card together and coloring her up the "my Spanish Harlem Mona Lisa" line from a Rob Thomas song kept playing over and over in my mind. What can I say? I'm kind of a nerd like that, LOL! So this challenge runs through January 3 and all projects entered must be new as of this challenge, no back linking. You don’t have to use a Some Odd Girl Stamp but if you do you’ll have two entries into the draw! Gotta love that. Today we've got a review preview of the Sweet November Winter Kids over on the ATS blog. 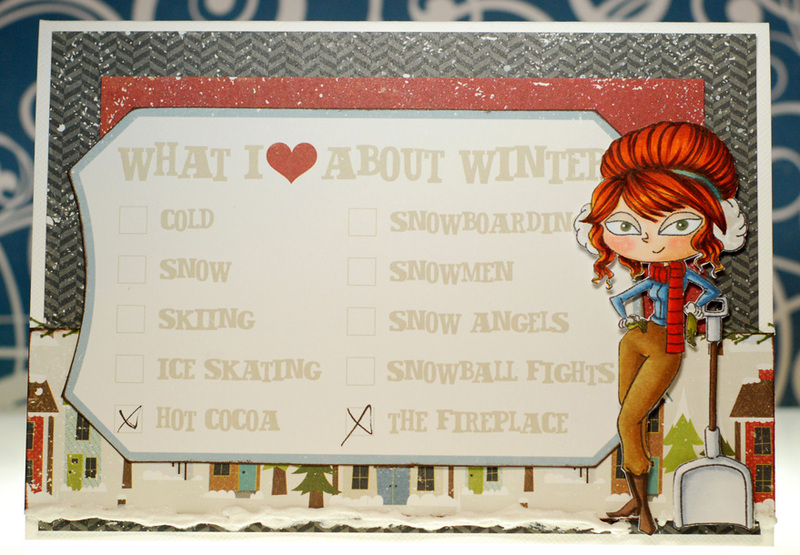 So I inked up little Zach again and created a fun winter themed boy card that can work for a number of different occasions. I know that I've used this Winter Park paper on a previous card but the great blues and reds were too good to pass up here. Plus the paper pack came complete with a sticker sheet that provided me with the sentiment and Zach's cool inner tube. Merry Christmas friends and fellow crafters! But enough of my slight paper obsession, LOL! Merry Christmas, Happy Hanukkah, Joyous Kwanzaa, and Happy Festivus to all! TGIF once again my crafty peeps! 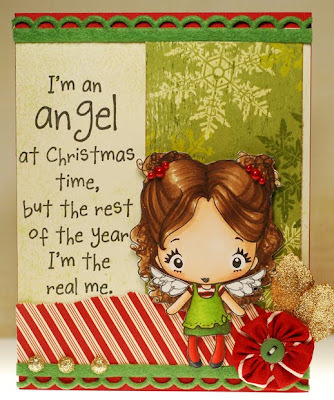 I've got a quickie card to share today, seeing as I've had Angel Celestina all colored up ever since the "lights/whites" video that I did a while back it would be a shame not to get her on a card before Christmas. She is such a beauty that I thought it best to keep things fairly CAS so I stayed with one subtle print and a touch of silver and sparkle to pull it all together. I think the whole thing looks quite peaceful and serene. And while I hate to cut this post short, I really must "dash away, dash away, dash away all!" Ok, now it's time for me to go be merry and bright for my customers at work. 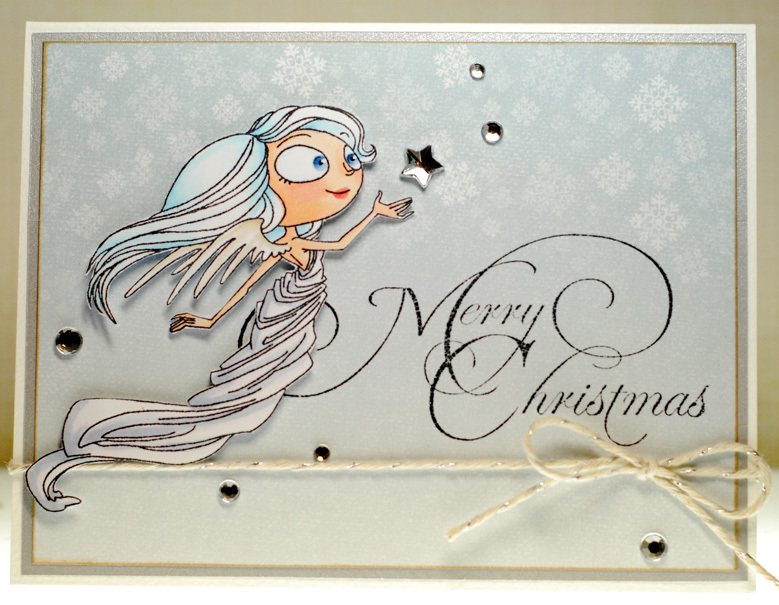 Though for now, I've altered up one of the newest Gorjuss Girl stamps to turn her into a little Christmas eve cutie. 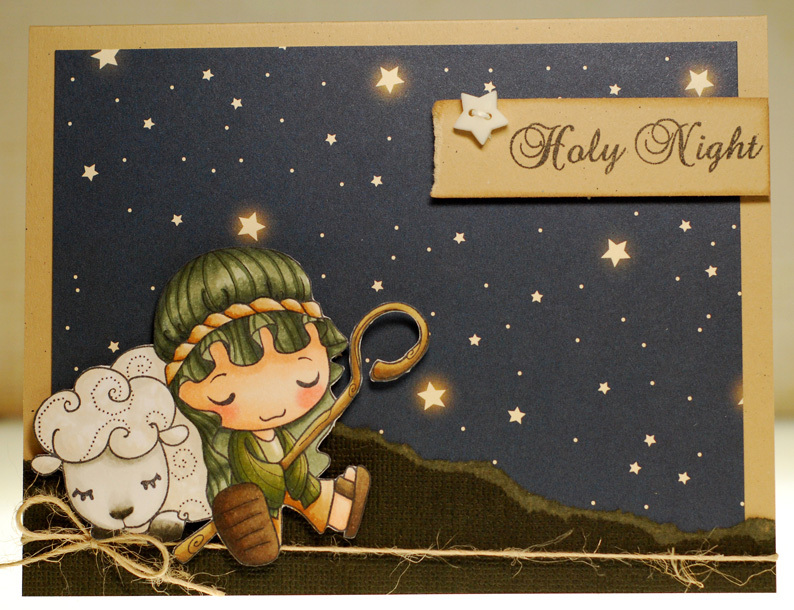 This stamp is actually called, Sowing the Seeds, and she has a little bucket and stars in the original image. I simply wiped away the stars and drew in an empty stocking for her to hold instead. Now she's ready to hang it on the mantle and try to get some sleep so that Santa will come and fill it with gifts and treats. I was going for a soft, fleecey texture on her night gown but I'm not 100% in love with how it turned out... I think I was a bit heavy handed with the color combo. But reds can be tricky so I'm not stressin' over it too much. Alrighty, time for me to get ready for work. I know that I used this paper a ton last year but I think this may be my first time pulling it out for a card here recently. 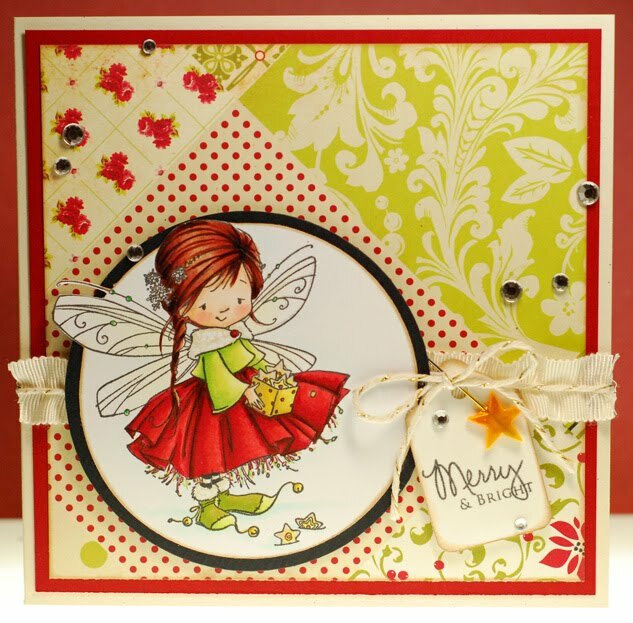 What can I say, I still love this print and I think it looks really pretty with this sweet Christmas fairy. Plus it was a scrap so I get to count it towards using up my stash, LOL! Oh, and speaking of videos... there is still time to get entered into my Copic giveaway over on Youtube. I'm drawing the winner tomorrow, so if you're interested all the info can be found here. Good luck! 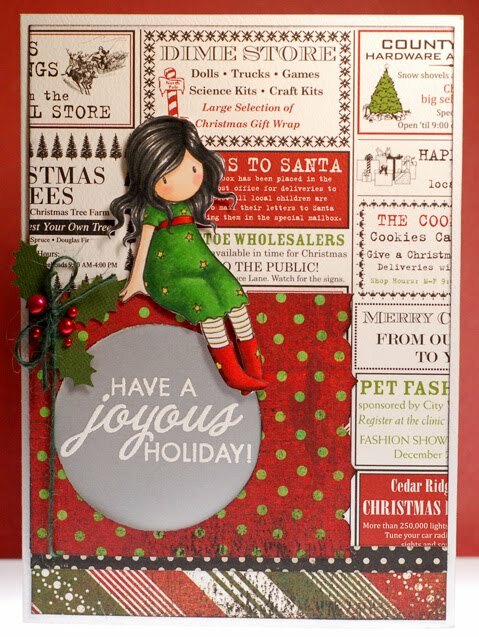 There are a lot of fabulous stampers joining the fun today so be sure to check out the entire list of hoppers over on the TGF blog. Not only are there two grand prizes up for grabs for those who made cards for the hop but they will also be drawing a random hopper to win the ENTIRE upcoming January Release! 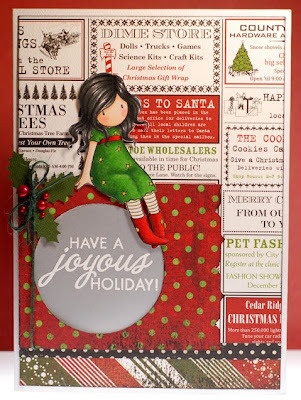 That's 6 sets in all... a HUGE prize...and the only way to win is by participating in the blog hop! My card today is for the Holiday Project hop theme and I went for a playful and cheery Christmas card featuring two of the fairies (turned elves with just a few snips of my scissors) from the Fairy Princess clear stamp set, as well as some Christmas cookies that I trimmed out of the Merry Tags. I envisioned these cute little elves helping out Mrs. Claus as she bakes and decorates a fresh batch of delicious snacks for Santa and the rest of the elves. Because you know those elves love sugary sweets to help keep them on top of their game, LOL! 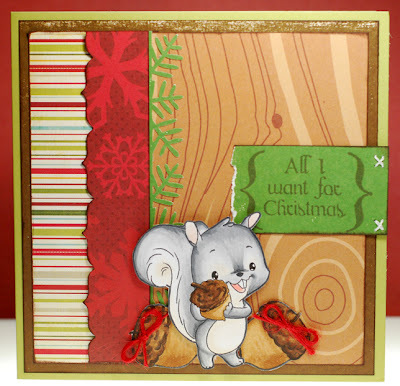 Seriously though, I had made this card for the ATS review preview this past Tuesday and I just couldn't wait 'til after Christmas to share it here. I used the brand new Big Heart Lula from CC Designs and paired her up with the pretty new Love Me papers by My Mind's Eye. The colors are so soft and dreamy and I just love that shot of baby blue thrown in with the different pinks. So of course I pulled all of the colors for Lula from that as well. 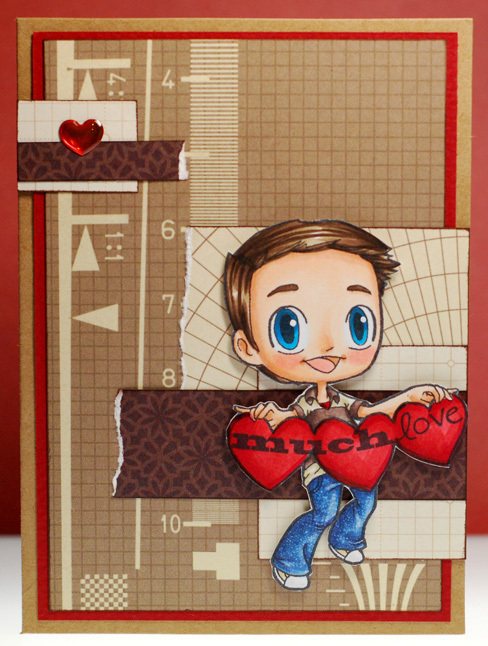 The big heart sign that Lula is wearing is actually nice and blank, which leaves plenty of space for you to add any small sentiment that you like to it... just think of the possibilities! This past week has been a bit of a break from Christmas cards, but today I'm jumping right back in to the good ol' holly jolly. 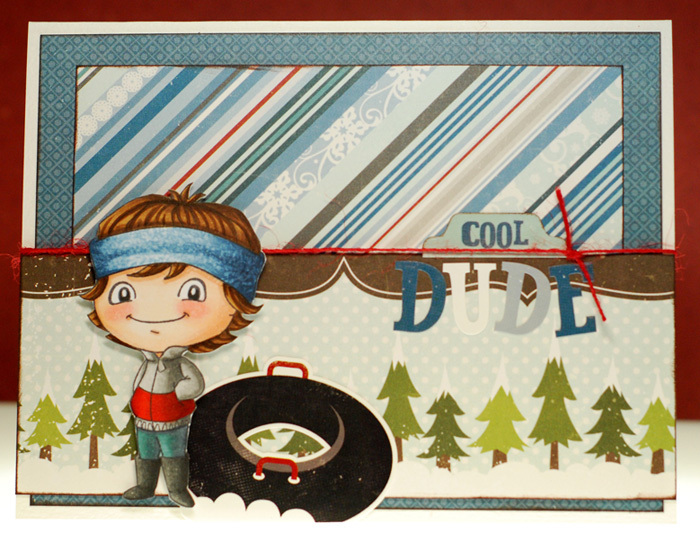 This was a fun one that I put together, completely inspired by that fun Kid's Quote sentiment stamp. So I did a bit of altering on Wild Sprout Matilda by wiping away her original eyes and tracing on DeeDee's wide, innocent looking eyes instead. Then I thought it would be cute to add a pair of angel wings, kind of like she's just returned home after the big Christmas pageant at school (hey, I can still remember wearing around tissue paper wings after one such concert when I was in grade school, LOL). The wings are a part of the Sweet & Toxic Creeper set, and with Matilda's long hair it was easy to glue them on. Okey dokey, I've got to scoot... work to get ready for ya know. Hope you all have a wonderful weekend! Ok, I just have to tell you all that I love, love, LOVE everything about this new set! 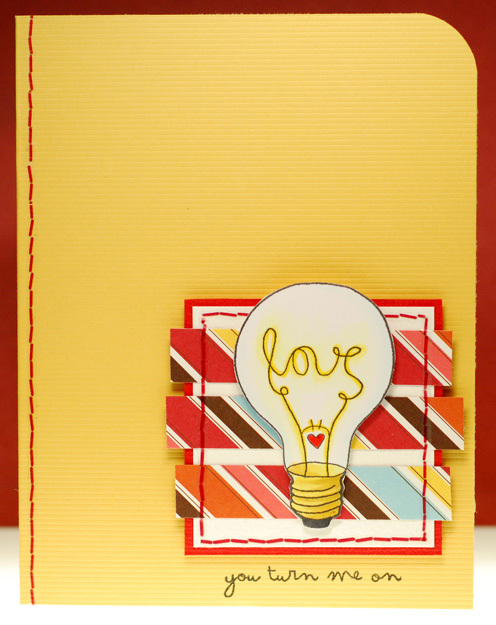 I'm not a seamstress in the traditional sense but I adore adding sewing notions to my paper crafts. Buttons, ribbons, pins, stitching... it's all good. Funny enough though, most of what I used on this card are actually stickers, LOL! Perhaps so, but I gotta say that I was tickled to finally put some of this old Sassafras paper to work. It's a bit more wild and collage-y than what I'm usually drawn to but it's the wildness of the print that I think works best here. Something about it brings to mind the feeling of euphoria and twitterpation that you get when first falling head over heels in love... a kaleidoscope of emotion if you will. Now be sure to head on over to the SOG blog today to check out the rest of the Oddie's cards. And if you hopped along with us over the weekend you'll want to see if you're the lucky winner of this fab Nutsy Kaylee set! 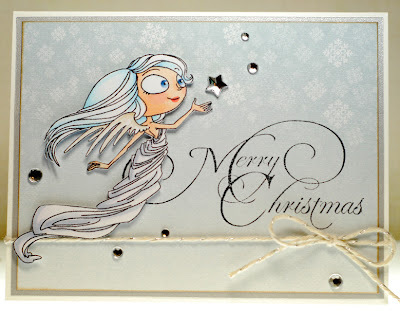 Now don't forget to check out the rest of the Oddie's cards over on the SOG blog today and if you hopped along with us over the weekend you'll want to see if you're one of the lucky Gwen winners! 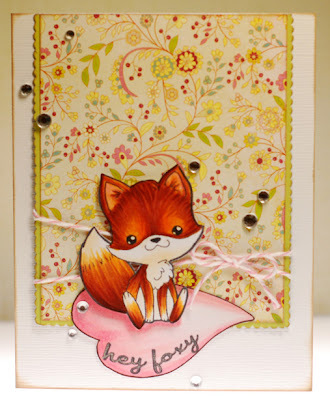 Ok, so don't forget to check out the rest of the Oddie's cards over on the SOG blog today and if you hopped along with us over the weekend you'll want to see if you've won your very own Lovey Tobie! Be sure to check out the rest of the Oddie's cards over on the SOG blog today and if you hopped along with us over the weekend you'll want to see if you're a winner of one of these new mini sets too! I hope all is well this morning. I'm having a wonderful weekend so far with a whole lot of nothin' scheduled for the rest of the day, LOL! I don't know if you can see it very well but I used a 'new to me' product on this card... those flecks of white in the background (I was going for the look of falling snow) where spritzed on using an October Afternoon Paper Doily Sprinkler. I have Erin (scrappyhour09 on YouTube) to thank for enabling me to give these a try. She has been using the Studio Calico version of these spritzers and I've really loved the look so when I had the opportunity to grab some OA ones during a Black Friday sale I couldn't pass it up. If I'm not careful I can see a new obsession forming... LOL! Thanks Erin! Anywho, I think I'm going to go sit with a cup of cocoa for a spell, so I'll see ya later. Have a wonderful weekend my friends! Welcome to the Some Odd Girl Valentine's Release Hop! Ok, you can hop now through Sunday, December 11th (midnight EST). Make sure to comment at every stop along the way because then you'll be entered to win a stamp set from the new release! We'll be giving away one of every set and announcing the winners all next week when the stamp sets are revealed. How cool is that?! So are you ready to feel the love? Then it's time to hop on over to Vera's blog! Challenge time at Tickled Pink! We've got a new challenge over on the Tickled Pink challenge blog today and we want to see you create a shabby chic style card. 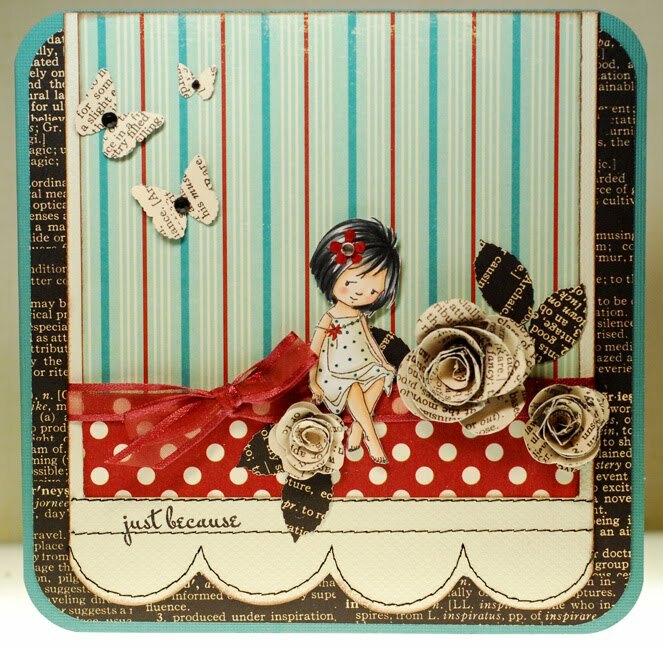 Now it is time for you to get your shabby chic on, check out the amazing inspiration from the rest of the design team girls and play along with us this week. There is a free digi of your choice up for grabs and the winner is now selected by random generator! 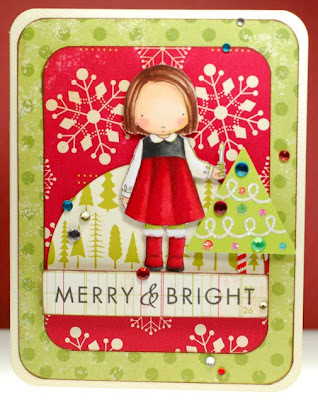 Sweet November Spotlight on Mette!